See the interactive and updated map from Google Maps. Momentum is building for the “24 Hours for the Lord” in which Catholic churches worldwide will open their doors for Eucharistic adoration and confessions this Friday night and Saturday, March 4-5. 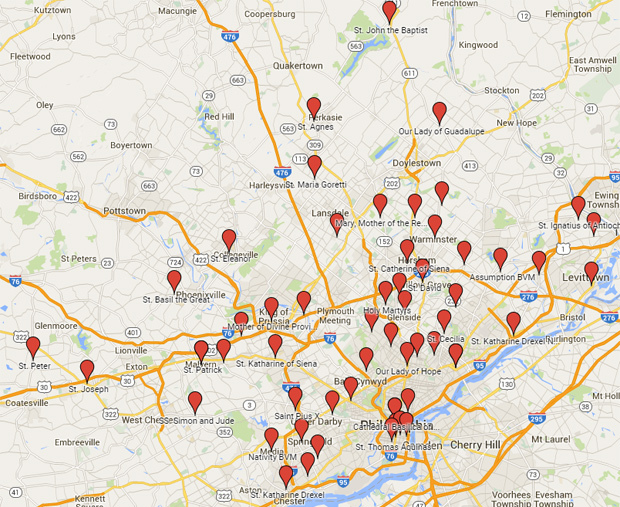 In the Archdiocese of Philadelphia, to date 59 parishes will participate. That is more than double the number of parishes from only a week ago. Pope Francis called for the special devotion this weekend during the jubilee Year of Mercy in the Catholic Church. Local Catholics are especially excited to respond to the pope’s invitation and join the worldwide event, according to Meghan Cokeley, a local organizer and director of the archdiocesan Office for the New Evangelization. Cokeley heard one local pastor, Msgr. Hans Brouwers, tell his congregation that St. Katherine of Siena Parish in Wayne is joining all the other Catholic churches in the world, and they can be proud to be part of that devotion. Keeping a church open all night immediately raises a concern of security, so some churches will remain open throughout Friday night with people signed up at all hours so that the church is always occupied while the Blessed Sacrament is exposed. For parishes that offer normally offer perpetual adoration anyway, the devotion is more easily accomplished. Cokeley said some parishes have arranged for extra security, including St. Katharine Drexel Parish in Chester where the city’s police department will patrol the church. But many parishes like the Cathedral Basilica of SS. Peter and Paul, where bearing the cost of private security is not an option, will close their church doors after an evening benediction of the Blessed Sacrament. The archdiocesan Office for Divine Worship has offered guidelines for celebrating the 24 Hours devotion – with adoration, benediction and confessions on Friday night and daily morning Mass, adoration, benediction, confessions and the evening vigil Mass on Saturday — but parishes are also customizing their participation. Some churches are welcoming a guest speaker to talk about mercy; at others a priest or deacon will preach on that theme during a Holy Hour and the traditional Stations of the Cross may also tie into the theme of mercy. Cokeley pointed to St. Katharine Drexel Parish as an example of creativity with the 24 Hours devotion. The Chester parish will celebrate their patron’s feast day (March 3) on the weekend with guest Father Thomas Viviano visiting and preaching for the parish. In addition to the opportunity for Catholics to spend time adoring Christ in the exposed Eucharist Friday night into Saturday, the sacrament of penance is also a focus of the 24 Hours. Typically, “the priest in the parish is hearing confessions more often” during the 24 Hours “with more frequent blocks of time,” Cokeley said. Some parishes might invite another priest to help administer the sacrament, but mostly, the parish priests “are committing to hearing more confessions themselves,” Cokeley said. She believes the focus on the mercy of God through the sacraments of Eucharist and penance is “tapping into the two great wellsprings of life in the church,” and she hopes the 24 Hours for the Lord not only bears fruit in this Lenten and Easter season, but far beyond.